With the warmer weather finally arriving here in the UK (and hopefully sticking around for the next few months! ), for this week's Wellbeing Wednesday we wanted to share one of our favourite summer salads. When the weather is warm, all we want to do is eat fresh and this fruity number is the perfect blend of salt and sweet to get your tastebuds going. Plus with its main ingredient being watermelon and feta, this tasty salad is relatively low calorie and absolutely bursting with blood pressure lowering vitamins and minerals, making it ideal for keeping a healthy heart. Fresh, healthy and bursting with colour and flavour this is the perfect treat for those balmy afternoons. Prepare it and serve immediately or leave for a few hours to let the flavours infuse. 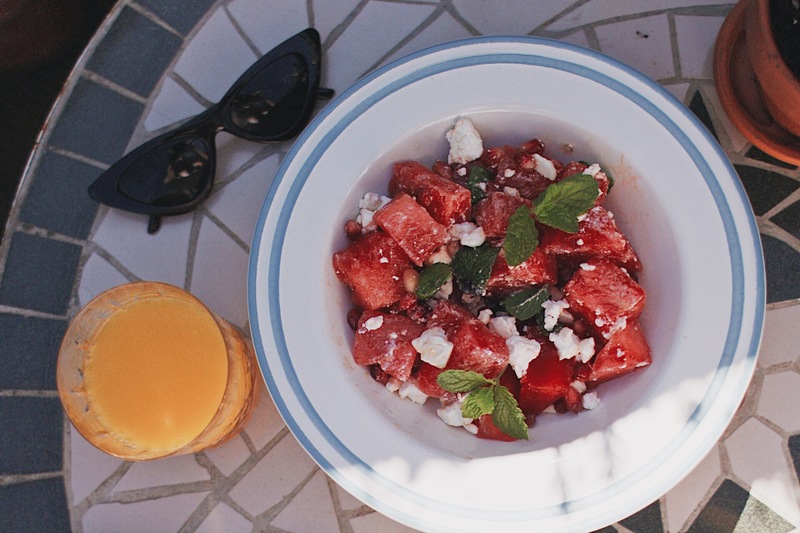 Either way, our Watermelon and Feta salad is the perfect refreshing bite for those sunny afternoons in the garden. Best served with a crisp glass of rose or your favourite fruit infusion! Prepare and chop up your melon into small to medium size chunks and add to a bowl. Taking your bunch of mint, gently twist some of the leaves, crumpling them lightly to unlock their flavour and adding the leaves to your bowl. Crumble your feta lightly over the watermelon and mint before drizzling with a tiny drizzle of extra virgin olive oil. Make sure you use a good quality olive oil to give you the most flavour packed salad and don't be too heavy handed with your drizzle! We don't want to drown the salad in oil! Finally give your salad a gentle toss to combine the mixture and add a final sprinkling of any remaining feta and pomegranate seeds. Garnish with a couple more mint leaves and you're ready to serve!